Indian P.M. Narendra Modi visited Canada for improving bi-lateral relation with Canada. During his visit to Toronto, Vancouver and Ottawa, he met Business man of Canada and met the vibrant Indian Diaspora to invest in India. According to the news the bilateral relationship and investment increased in the field of Science and Technology, Infrastructure, Innovation, Education, counter- terrorism and security. Taking look into geographical location between India and Canada, India is located in the eastern and southern part of the world, whereas Canada is situated in the northern and western part of the world. Still being far away from each other these two countries share a long standing relationship and have a mutual interest for each other. 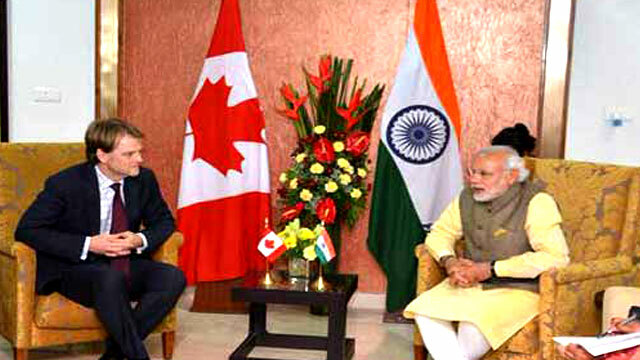 India is the only largest trading partner for the Canada in the south Asian region. Canada is having an abundant amount of uranium deposits in the world and both the countries have agreed to share the resources and act as a helping hand towards each other. Canada Consulates are situated in Bangalore, Chandigarh and Mumbai. He, along with Canadian international education strategy has planned an action plan towards increasing the number of students for migrating to Canada for higher studies. Presently there are more than 35000 students who are studying there. The Canadian government is keen in improving these stats to double by the year in 2022. 3. Recently CHRIS ALEXANDER Canadian minister of migration and citizenship has given the prizes for the best immigrant entrepreneur for the year 2015.